Hey everybody! Happy Tuesday! I finally dug myself out of the sewing rut I’ve been in (thank you Pinterest) for the past week and took some pics of recent projects I’ve finished and some other me-made looks. 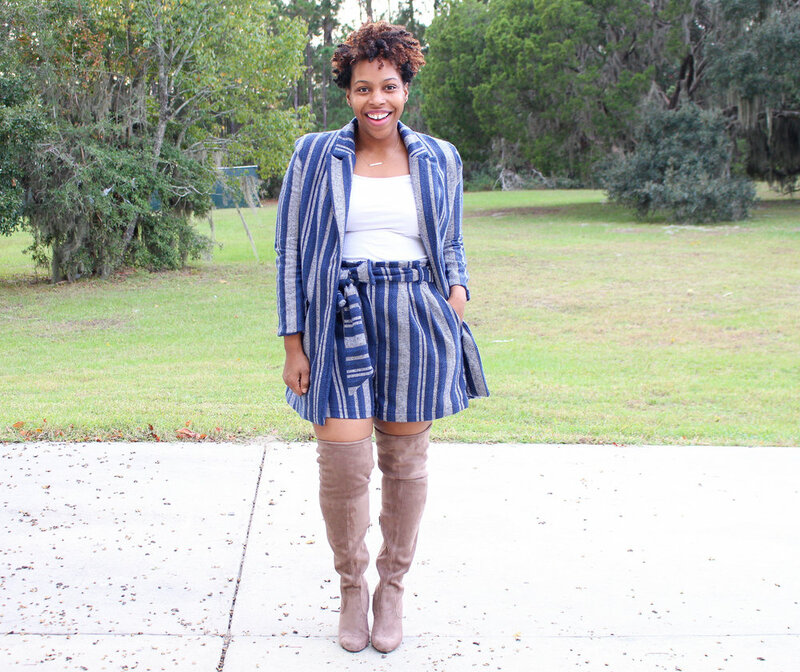 The look I’m sharing today is definitely a Fall favorite! 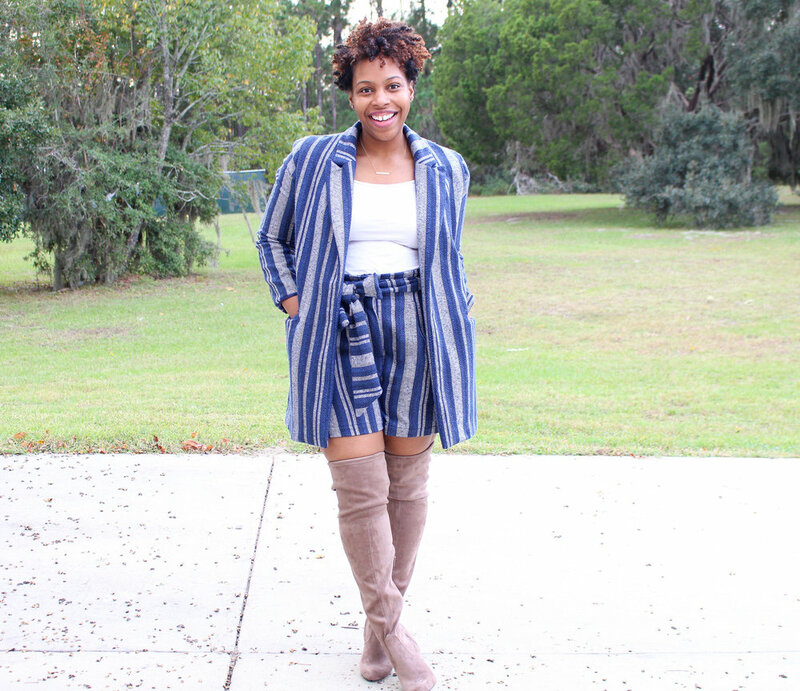 I really didn’t have a plan going into this project, but in the end I created two great separates that I know I can mix and match and have on repeat in my closet! So let’s start with the coat first. For my coat, I used Simplicity 8749 View C. I was in LOVE with this pattern when it was first released, so I’m really happy I actually found time to make it. You know how it is when you see new patterns and want to make them all, but time gets away from you and it doesn’t get made until months later. Yeah, that’s what I didn’t want to happen with this pattern. LOL! For size, I cut the 16. I didn’t do any pattern line merging because I wanted a fitted open coat. I don’t live in really cold climates, nor do I wear my coats/jackets buttoned up. So the look I was going for, was a casual fitted coat I could pair with jeans and a t-shirt or in this case super cute shorts. I was hoping to find a fun lining but ultimately I went with a solid navy from Joanns. It took me about 2 days to complete the coat. It probably would’ve taken long had it not been for Mimi G sew along. Lol! If you’re a visual learner like me, watch the video! For the shorts, I went with my TNT McCalls 7726 View A. I’ve made the other views on this pattern, and I also have two tutorials on YouTube for them, but for some reason I wrote off the shorts saying “they were not for me”. I was wrong! These are super cute, and now I want to make more shorts! I cut the 18, and made no adjustments to them. I will say the only thing thats not my fav with this pattern are the pleats on the back. 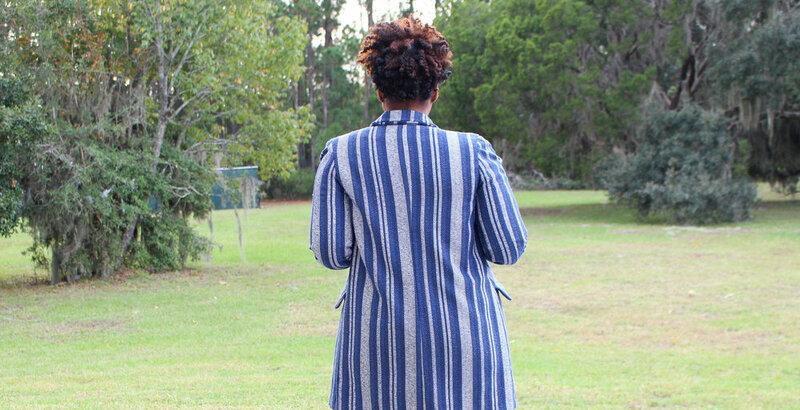 With my full bottom, the pleats pop out instead of laying flat. I know I have like 5 pairs of these pants, but with the shorts, I notice it a bit more. I’ll probably continue to use this pattern for the pants, but look for a flat back pattern for shorts. Its a ton out there so I’m sure I’ll find something quick! For fabric, I used this amazing Tweed from The Fabric Store Online! I love this store! Always amazing quality and unique fabrics! 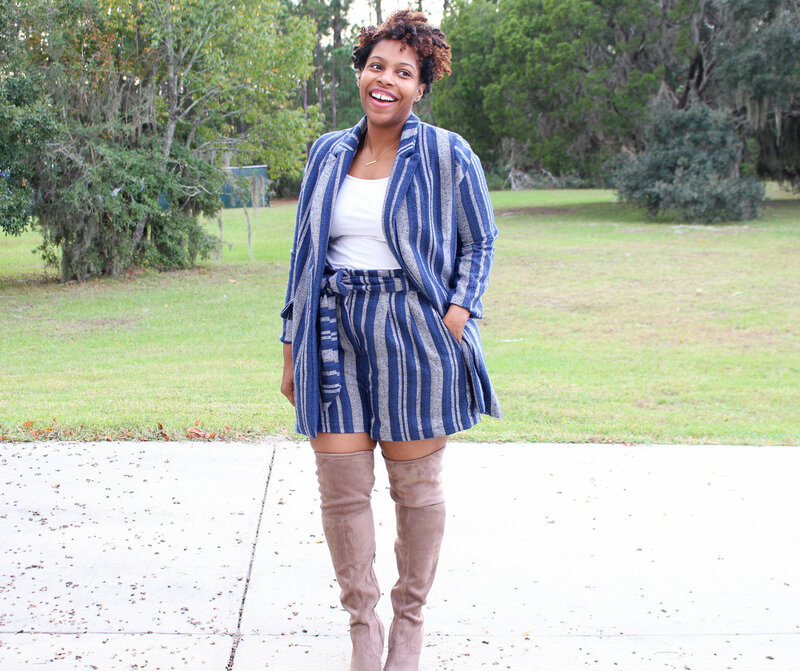 I paired my look with my Over The Knee boots that I bought from Target last year! So glad I bought these in both colors! They are a WIN!! 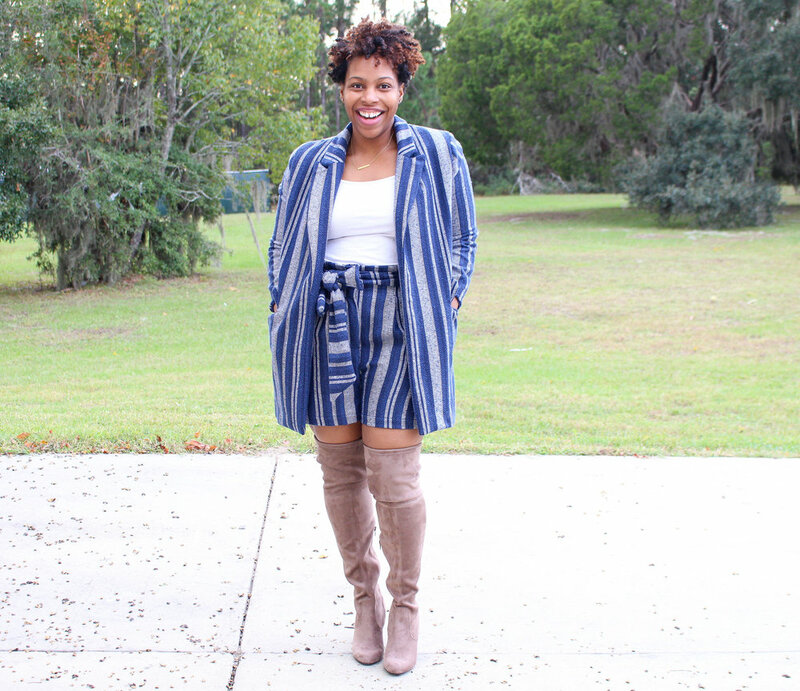 Overall, I love this look and I can’t wait to style these pieces separately. I see some tights, an oversized sweater, jeans….yeah, I’m gonna have some fun with this suit! Thanks so much for stopping by! Until next time….